Men and women are redefining all the rules, because good loving ain’t easy! Can a man be successful, handsome, sensitive and still be faithful to one woman? Author Barbara Wright Sykes brings you a novel of love, fortune, family values and suspense. 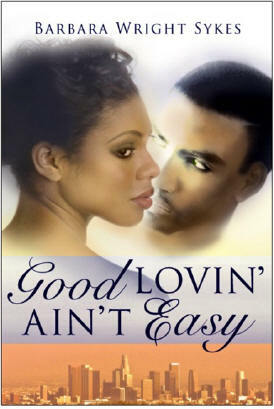 Good Lovin’ Ain’t Easy is an exhilarating read! JD and Myrna Calhoun…Leaving their past behind, the Calhoun’s come to California, to pursue their dreams. It wasn’t long, however, before JD became prey to the oldest temptation. With money rapidly disappearing, Myrna is forced to choose between her love for JD and her daughter, Veda Marie Calhoun’s security. Suddenly, JD acquires enormous wealth from the demon that held him hostage. But will the taste of sweet success be short-lived when two scandalous females set out to steal his money? In an act of desperation, JD becomes a man with a mission: To recover his fortune and save his marriage. Veda Marie Calhoun…An attractive, young woman, not born of wealth, but a product of wealth, finds that life holds the beauty of love. For her, however, it comes at an enormous price when Monica Webber, her fiancé’s psychotic ex-girlfriend, comes to California. Monica has only one thing on her mind-to reclaim what she feels is rightfully hers-Veda’s fiancé, the handsome Charles Winston Caziere. If you can, please purchase a copy today and find out for yourselves why Good Lovin’ is never easy.